Over the past two decades, food waste and obesity have nearly doubled at equal rates. 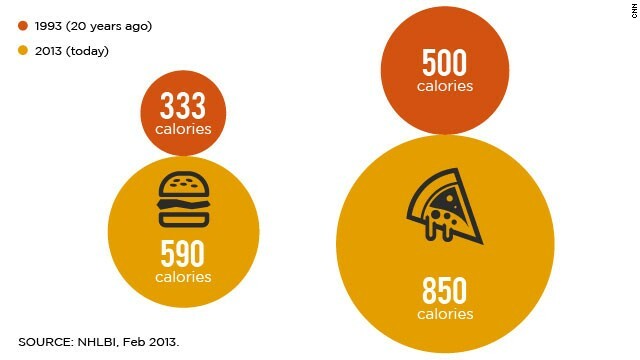 The surface area of the average dinner plate expanded by 36 percent between 1960 and 2007. Parallel to increased portion sizes, between 1987 and 2010, the number of Americans diagnosed with diabetes almost tripled to 20.9 million. Studies have shown that if our plate contains more food than our body physically needs, we will eat it without conscious consideration. A recent study shows 50 percent of all food produced on the planet goes in the trash. 90 percent of water consumed in the United States is for animal and crop-related farm uses. That means food waste accounts for more than a quarter of our total water consumption. Food waste in the U.S. exceeds 55 million tonnes per year, which produces life cycle greenhouse gas emissions of at least 133 million metric tonnes and costs $198 billion. In Toronto, Canada more than 17.5 million kilograms of food is thrown out every month and in Britain, the government’s Waste & Resources Action Programme estimates that $17.5 billion worth of food is wasted every year. The article’s author, Rachel Smith, is the co-founder of Halfsies, a nonprofit working to address this issue. Halfsies encourages everyone to “Eat less. Give more.” It is a social initiative offering restaurant-goers a healthier meal portion which also reduces food waste and supports the fight against hunger. Halfsies partners with restaurants to offer half portion meals at full price. What restaurants don’t put on the table, they donate as cash. A portion of the proceeds from the meal goes to support reputable organizations with sustainable programs fighting to end hunger. Individually we can make a positive impact on the environment and our health by being more conscious about what we eat. Color Me Healthy has some great resources and diagrams on healthy portion sizes, including how to use your hand to find the right portion size for a lot of foods. You can also change your meat consumption habits to address these issues. Read “Meat. Eat Less. Eat Greener.” to find out more.